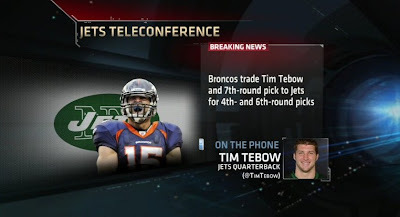 Well, true believers... it looks like they won't be seeing much more of this in Denver, as Tim Tebow has been traded to the New York Jets. It turns out, God...being the public relations genius that He is, thought the best place for His superstar was in the massive media market of New York. Now, Tim can teach the whole world how to Tebow after all. As I signed on to the internets today, all I really wanted to hear was what Tim Tebow had to say about his new home...not what some crumb bum prognosticating sports commentators thought of the situation. But this information seemed to be quite unusually hard to find, for some reason. So being the investigative reporter that I am, I decided that I must seek out this information, and put it here on http://jimmyfungus.com , so at least MY readers would not be in the valley of darkness on this issue. ...God bless you, and thank you for your support. I have a lovely post about this for tomorrow. Even tho I'm a NYer, I HATE the Jets. Why would Tebow do this?? Why?! Haha. Can't wait for the post tomorrow. Jesus often sits with me, and we talk over a cup of tea. He doesn't like this guy, and neither do I.
Oh dear Lord... well, at least you like Dax Flame. To be fair I only watch sports to see men in tight outfits...that's all I got! But New York is one of the most un-Godly places there is! He reminds me of Gary Glitter. I don't think a QB controversy is going to help the Jets. As a fan of the Chargers, I'm OK with this trade. 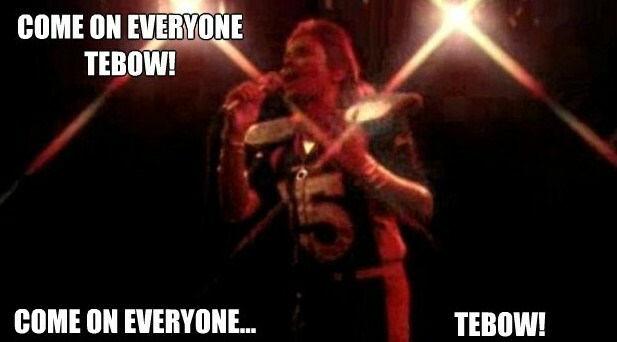 Oh Tebow, you so crazy.